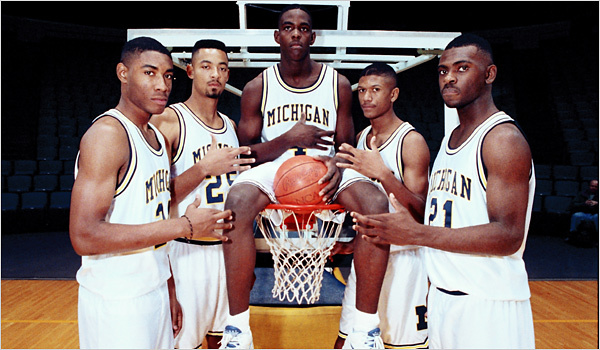 The Fab Five were in action just a few years after I graduated from U-M and I watched their exploits very closely.That made writing this story for Slam about a decade a go a special pleasure. It stands up well. Enjoy it as a March Madness moment. A look back at one of the most impactful team in college basketball history. The Fab Five will forever be remembered by fans and critics alike, both for their on- and off-court antics. Meanwhile, this year’s edition of the Wolverines, led by the backcourt duo of Tim Hardaway Jr and Trey Burke, are co-Big Ten champs and have Michigan fans hype heading into March. Enjoy this look back at a classic piece, and expect plenty more to come as the NCAA Tournament approaches.— Slam Ed. Vitale’s statement is accurate but stunning nonetheless. How could the Fab Five be underrated when, despite never winning a league or national championship, they still managed to change the face of college ball? The concept would have been unfathomable nine years ago when Chris Webber, Jalen Rose, Juwan Howard, Ray Jackson and Jimmy King were garnering countless headlines and being covered in a manner more MTV than ESPN. And just like every new sensation from Elvis to Eminem, there was debate about whether the Fab Five represented something creative and wonderful or arrogant and destructive. Their brash confidence, in-your-face trash talking and hip-hop fashion sense were both embraced and attacked like no college sports team before or since. The debate continues to this day, especially in Ann Arbor, where the basketball team struggles along under a cloud of impropriety that dates back to the Fabs’ recruitment. But one thing is beyond debate: The Fab Five represented something entirely new, an entire class of blue chip recruits covering every position, each of whom lived up to their top billing. Power forward Webber was Michigan’s Mr. Basketball and the nation’s top recruit. Howard, a 6-9 center, and the 6-5 shooting guard King were the top players in Illinois and Texas, respectively, and Rose was a 6-8 pg who had led Detroit’s Southwestern High to two state titles. Jackson was the only one of the five who wasn’t a McDonald’s All-American, but the 6-6 Texan was one of the nation’s top small forward prospects. And while serendipity and coach Steve Fisher’s intense leg work certainly played huge roles in landing such an esteemed class, the Fab Five also recruited themselves. It didn’t take long for the dreams to come to fruition; all five recall that the chemistry was immediate. “The day we all met, we played a pickup game outside our dorm and it was just there,” says Webber. Nonetheless, it takes a huge leap for a memorable pickup squad to become an NCAA title contender. Most great college teams result from a slow blending of talents, with experience trumping nearly everything else. The Fab Five turned that formula on its head. Juniors Pelinka, James Voskuil, Michael Talley and Eric Riley were key contributors, but clearly support players to the five freshmen, a seemingly impossible situation deftly managed by Fisher and his staff. While the Fab Five’s critics accused them of showboating—“too much with the French pastry and the hot-dogging!” proclaimed broadcaster Al McGuire—the fact is, they played solid, team-oriented ball. If you watch their games today—easy to do, thanks to ESPN Classic—you’ll see a confident unit playing great help D, running crisp sets and effortlessly improvising whenever necessary. “We had pretty good game-time execution, which is often overlooked because of some of the players’ flamboyance,” says Jay Smith, then a Michigan assistant, now the coach of Central Michigan University. Indeed, from their very first tip-off, Webber, Rose and King in particular exhibited tremendous flavor to go with their savvy. Webber was a dominant post presence with supple hands and ferocious power. Rose was a cocksure point with maddening lapses but an uncanny knack for coming through in the clutch. And King was a tremendous finisher as well as a deadly three-point shooter and reliable defensive stopper. Howard, meanwhile, was rock solid in the post, making teams pay for collapsing on Webber, and Jackson was a steady hand who often came through with crucial baskets, boards and stops. All five turned in highlight-reel-worthy jams on a regular basis. But much of the initial buzz about the Fab Five had little to do with fundamentals—or basketball at all. Gallons of ink were spilled about their flapping shorts, black socks and gleaming bald domes and their constant on-court chatter, as they endlessly jawed at both opponents and each other. If it seems hard to understand why such things would cause a furor, that itself is evidence of the Fab Five’s impact. Watch their games and you’ll see that while the Fab Five’s opponents look dated in their clingy unis, the Michigan youngsters—even now—look contemporary. “They completely changed the fashion of college ball,” says Ayers. And while some critics blasted Fisher for allowing such freedom, the coach wisely used it as a motivational tool. The group first came to serious national acclaim in the fifth game of their rookie year, when they took defending champ Duke to overtime before falling 85-81. Most observers considered it a great moral victory, but the Michigan players were incensed they lost a game they could have won. But while the sight of Webber and Rose yapping in the faces of Christian Laettner and Bobby Hurley delighted those who found the Dookies arrogant and insufferable, it also ruffled a lot of feathers. Columnists spewed and older Michigan alums stewed. Even refs weren’t beyond getting in on the act, as when Rose got T’d up for smiling. The Fab Five seemed unbothered by any of it, however, finishing their freshman season 21-8 and ranked 14th in the nation, with a sixth seed in the Big Dance. In a fitting omen, the team ran into Muhammad Ali, the man who invented trash talking, at their Atlanta hotel the night before their first tournament game, against Temple. When The Greatest pulled Howard close and whispered “Shock the world!” in his young ear, The Fab Five had themselves a new rallying cry, which they rode to an Elite Eight battle with Big Ten champion Ohio State. The Jim Jackson-led Buckeyes had beaten Michigan twice already, but things had changed. Different enough to win a thrilling OT game, 75-71, catapulting them to the Final Four, where Nick Van Exel’s Cincinnati squad lay in waiting. After winning a nail-biter, the Fab Five had another date with Duke. Though they seemed unflappable, they came out for introductions lacking their usual fire, with nary a chest bump or holler. But if the rookies were a tad nervous, the reigning kings looked downright spooked. Perennial tourney hero Laettner sleepwalked through the first half, and the Fab Five clawed their way to a one-point lead. It didn’t last. At the six-minute mark of the second half, the roof caved in and Michigan suddenly couldn’t score or defend. They ended up losing by 20, sending Webber running off the court, his uniform pulled over his sobbing eyes. In the locker room, he and his teammates all pledged to never again feel such crushing disappointment. They were at least sure of one thing: there was always next year. And, indeed, many younger fans gave serious love. Though they were widely criticized in the press, baggy shorts, black socks and M logos became as ubiquitous as Nikes on playgrounds and in gyms from coast to coast. And the impact was felt throughout college ball. Opposing coaches began letting their players alter their uniforms, and the Fab Five’s fashion sense already seemed less radical. By the time they faced North Carolina in the ’93 title game, the Tar Heels shorts were even longer than theirs. But that was little consolation to a group of 19-year-olds who felt themselves being tarred and feathered as everything-that’s-wrong-with-sports-and-kids-today. In truth, as sophomores, the Fab Five were sometimes a bit out of control. After a big win at Michigan State, several players pretended they were defecating on the Spartans’ center-court S. And the team talked incessant trash before an early season rematch with Duke, with Webber saying he “wished Laettner would come back from [the NBA] so we can beat him too.” The Cameron Crazies had a field day heckling the team, as Duke pasted them by 11. Still, the Fab Five righted themselves to go 25-4 and earn a No. 1 seed in the West regional. Now the attacks could really begin. Before the start of the tourney, Bill Walton called the Fab Five “one of the most overrated and underachieving teams of all time…who epitomize a lot of what’s wrong with a lot of basketball players.” It was the most vicious and well-publicized—but certainly not the only—assault on the team. In the second round, the overrated underachievers pulled off the greatest comeback in Michigan history, coming back from 19 down to beat UCLA in overtime 86-84 on a King putback at the buzzer. After beating George Washington, the only thing standing in the way of a second straight Final Four was Temple, led by Eddie Jones, Aaron McKie and a bunch of less-talented tough guys. Chaney’s big men did everything but gouge out Webber’s and Howard’s eyes. On the verge of defeat, Chaney was finally T’d up for spewing profanities at both Fisher and the refs, had to be restrained by his assistant coaches and finally refused to shake Fisher’s hand—then went to a press conference and blasted the Fab Five for taunting. In the semifinals, Michigan was a seven-point underdog to Jamal Mashburn’s powerful Kentucky team, which had dismantled its previous tourney opponents by an average of 31 points, thanks to Rick Pitino’s brutal end-to-end pressure. The Fab Five took the Cats into OT, their fourth extra period in eight games, before winning 81-78. It was not only their best-played game in months, but also one of the most memorable Tournament battles in recent years. Despite all the criticism, pressure and close calls, they’d made it back to their second title game, where they would face UNC. In the first half, the Fab Five were again flat and out of sync, down six at the break. Then Fisher aggressively challenged them in the locker room and Webber lifted the team en route to 23 points, 11 rebounds and three blocks. The team got in trouble when Rose and King lost their shooting touches down the stretch, but Webber seemed fated to be the hero when he grabbed a missed UNC free throw with 20 seconds left and looked upcourt. After getting away with an uncalled traveling violation, he was headed for the history books—for all the wrong reasons. Carolina led by two. With Rose covered, CWebb headed to the other end of the court, picked up his dribble and panicked. With Pelinka wide open and desperately waving his arms behind the three-point line across court and King staking out position underneath the basket, Webber called timeout. Michigan had none left. A T was whistled, UNC hit the shots and went on to win 77-71. To a man, the Michigan players will tell you they never considered the possibility of losing that game. So they had to skip doubt and leap directly to heartbreak. Again. Before long, Webber would announce he was leaving school for the NBA, and that was that for the Fab Five. They finished their two-year run at 56-14, including losses in the two games that mattered most. Might Walton have been right? Were they just a bunch of overhyped losers? If you ever ask Vitale that question, be ready to duck. 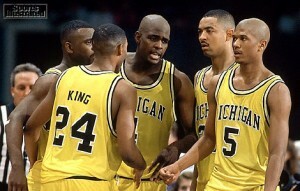 And no team ever proved that point more than the Fab Five. Hey, you read this far. Now don’t forget to take a look at my book, Big in China: My Unlikely Adventures Raising a Family, Playing the Blues, and Becoming a Star in Beijing. hello!,I like your writing so a lot! proportion we be in contact more about your post on AOL? I need an expert in this area to resolve my problem. May be that’s you! Having a look ahead to see you.